Who else loves a good, cool, crunchy side dish? It’s pretty much the perfect addition to any type of grilled meat which also makes it perfect to take to a gathering with friends. This recipe has healthy fats (walnuts, almond butter, avocado oil) which will help you feel full along with some fruits and veggies that will load you with fiber and vitamins. 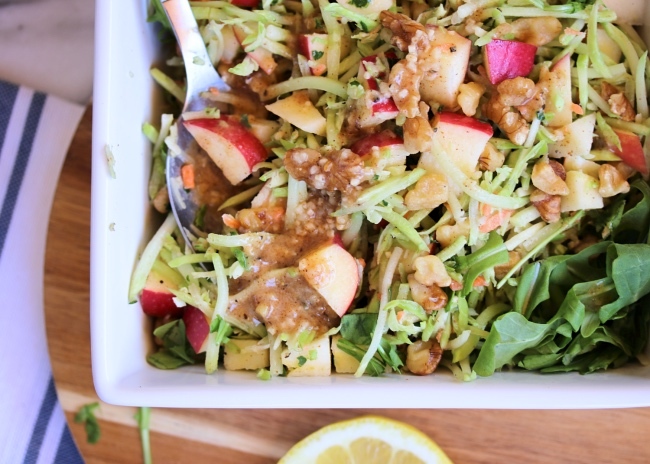 In a small bowl, whisk the remaining ingredients (almond butter, ACV, lemon juice, garlic, & avocado oil) until fully combined – this is your dressing. Thanks to Just Jessie B for this recipe!